Cornishman Tom Palmer was a versatile utility back who was equally at home in the centre or at full back, although his preferred position was outside half. He was also a useful goal kicker. Tom had already played with distinction for Truro, Cornwall, South West Counties and the Civil Service before he joined Gloucester from Cheltenham in 1968. He went on to make 210 first team appearances for Gloucester, scoring 258 points, and played throughout the successful 1971-72 cup campaign. The same season he was England’s back reserve for all the Five Nations matches and that summer toured South Africa with England. He played 52 games for Cornwall. Tom Palmer was born in Tavistock on 15 June 1943 and played his early rugby for Truro. He was a civil servant with the Ministry of Agriculture, Fisheries and Food in Truro and first represented the Civil Service against the Army at the age of 19. Tom played centre for the Civil Service in a notable 22-12 victory over the Army at Aldershot in March 1965 and that October made his debut for Cornwall in an 8-6 victory over Devon. Two weeks later, he played against Gloucestershire for the first time in a 3-0 defeat at Camborne. The match was Alan Brinn’s debut for Gloucestershire. Tom moved north later that season and joined Cheltenham, playing against Gloucester at Kingsholm. In 1967, he took part in the remarkable three match County Championship semi final tie between Cornwall and Surrey. The first match at Redruth ended in a 6-6 draw, although Cornwall outscored Surrey by two tries to nil. The replay at Richmond was also drawn 14-14, when Roger Hosen equalised for Cornwall with the last kick of the match. The third game, back at Redruth, saw spectators hanging from the roof of the grandstand and perched in surrounding trees. Sadly, Surrey won convincingly by 14 points to three, but the tie and the team entered Cornish rugby folklore. Tom also played for South West Counties against the Australians in a narrow 11-6 defeat at Camborne in January. Recovering from a cartilage problem that autumn, he struggled to regain his place in the Cheltenham 1st XV, where he was competing against the current Gloucestershire outside half Bob Redwood. 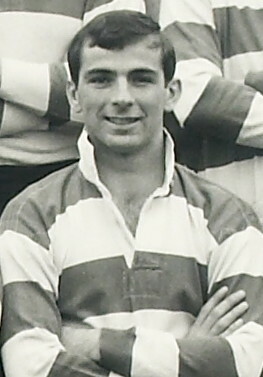 As a result, when Terry Hopson resigned from Gloucester and moved to Bath on 3 February 1968, Tom Palmer resigned from Cheltenham on the same day and joined Gloucester. When the move was announced the Citizen commented “Tom Palmer was out of the game for several months with cartilage trouble but has now fully recovered. Although his favoured position is outside half, he switched to centre for Cornwall against Gloucestershire at Redruth last Saturday week. His vast experience should be of immense benefit to Gloucester”. In 1968-69 he played 41 games for Gloucester, despite representing Cornwall throughout a County Championship season in which they reached the final against Lancashire, played in front of 22,000 spectators at Redruth. Cornwall lost 11-9, after leading 9-0 at one point. On the way to the final he played in a 15-9 victory over Gloucestershire at Kingsholm in November. With the return of Terry Hopson for one last season in 1969-70, Tom demonstrated his value as a utility player at both full back and centre, but in 1970-71 and 1971-72 , following Hopson’s career-ending injury, he formed an outstanding half back partnership for Gloucester with the veteran scrum half Mickey Booth. 1971-72 was the climax of Tom Palmer’s career. He partnered Mickey Booth throughout the five rounds of Gloucester’s successful cup campaign, culminating in the 17-6 victory in the final, in which he dropped a goal. He was England reserve for the back division for every Five Nations match that season and captained Cornwall in the County Championship. In the summer he toured South Africa with England as a utility back. One of three Gloucester players in the touring party, alongside Mike Burton and John Watkins, he played in wins over the South African Federation and Bantu XVs and in a 13-13 draw against Northern Transvaal. Bob Redwood joined Gloucester from Cheltenham in September 1972 and Tom moved to the centre, although playing at outside half when Redwood was unavailable. He broke a toe and did not play for much of that autumn but was chosen at outside half for South and South West v North at Broughton Park on 2 December in the first of two England trials to select the team to play the All Blacks. However, although he scored his side’s only try, he clearly lacked match practice and was dropped for the second trial. Despite this, he captained South West Counties from centre against the All Blacks at Redruth on 2 January, four days before the international. He continued to alternate between outside half and centre the following season and played in the centre for Gloucester in their 24-14 Centenary Match victory over a star-studded International XV in October. His last game for Cornwall was fittingly at outside half against Gloucestershire at Camborne in a South West Championship decider, which Cornwall lost 9-7, although scoring the only try. Tom Palmer played in three games in five days at the start of 1974-75 (including a 75-0 victory over L’Aquila of Italy at Kingsholm) but, in the third game of the season, disaster struck. On September 11, he broke his ankle in the 20th minute of the 17-9 victory over Stroud at Kingsholm. The injury ended his Gloucester career.